I am perfectly OK with the second part…. Thanking you all for being part of my year but not because it is a great year; I want to make sure you are part of it even it is not great…. but I wish I can be part of yours even if yours is not a great year…. I thank you because you all have connected with me in one way or other…. why? because there is a thrill in anticipating what we do not know, hoping for the better and planning for the better; because we all know we have made some mistakes this year and want to correct them next year. Some things did not go that well for us and we want them better…. The anticipation of a new year just tells us that the year that passed was less than great and there is a lot of room for improvement… Well you might say it says great year and not a perfect year…. but when FB says Great hear that is only one side of the story. How do I know that…? I know that because Facebook is not life… it is just that ‘face of life’ that people want to show the world…. I am a heavy Facebook user…. but even for me I do not put everything on Facebook…. Facebook for me is a place to express my creative endeavors and opinions and then some fun moments (I repeat fun moments) from my personal life 🙂 Both my life and my creative interests exist and expand outside Facebook… Facebook is not my life and I don’t think it yours either… So they should probably change it as ‘Facebook year’ and not just ‘year’… For Facebook, FB is the reference point, but for you, it is your life… not the same….not the same..
And if as an individual I only have fun moments in my life then I should either be having a problem or I should be sitting somewhere preaching the secret of how ‘life’ can be ‘all perfect’. If you think about it, all active Facebook users if you go by their FB posts and pictures are masters of achieving ‘perfect life’ and can preach about it. But that is not how life works. There are many things that can been done better. There are many things outside the Facebook that went wrong, that we are sad about, that we wish should not have happened, things we are more happy to let go and push to the past than post, share, like and comment about… Facebook is not Life. I want to wish you that, this dark mirror in your life start reflecting enough light to glow your surroundings… Keep using Facebook… but Facebook is not your life or my life…. 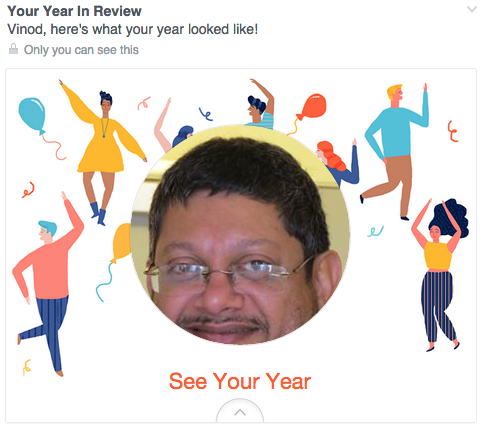 I want to wish you a Great Year; Not a ‘Facebook Year’ but a real great year ahead……..